Roof repair and replacement jobs are better performed by your trusted roofing professionals. It can be dangerous, and requires specific skills and experience. However, there may be instances that you will be left to do your own roofing repair. In doing simple roof repairs yourself, it is important that you equip yourself with the roofing tools and equipment commonly used by roofing professionals. Below are some roofing tools and equipment to add to your arsenal of house repair tools. Unless you can exceptionally leap, or you can fly, you will need a safe way to access your roof. A ladder is a practical and inexpensive way to do so. Choose the most stable ladder model you can find for your own safety. For homes with more than one story, a scaffold which you can rent would be safer to use. Also known as a roofing hatchet, this tool is a must in every roofer’s arsenal of tools. One end of the hammer is made for setting nails, the other end is made to split shingles. 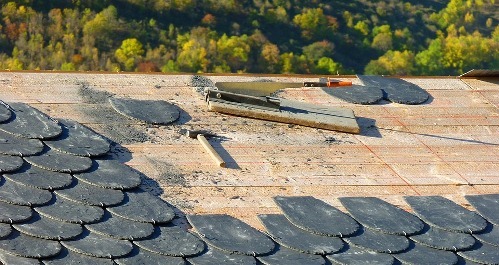 Some hammers will have built-in levels or gauges, which allow for quicker alignment of shingles. This tool goes hand in hand with your roofing nailer. A roofing hammer can be used in replacing a few shingles, but for the whole roof, a roofing nailer is your best bet. A roofing nailer helps speed up installation. It is an essential tool for every roofer. The skill developed in nailing at a productive speed is a must for professional roofers. A nailer can be pneumatic style, or battery operated. Known as the shingle remover, this tool helps in tearing up existing roof shingles. It also removes nails attached to the old shingles. A roofing shovel can have several blade variations, with the serrated blade the most common. A shovel with a serrated blade ensures that old nails are removed. A hammer tacker or a hammer stapler is used to affix roofing staples to thicker roofing materials, using heavy, non-rusting staples. It is durable and uses T-50 staples. To ensure proper placement of your roof shingles, horizontal and vertical chalk lines are used to measure exact positioning of shingles. These bars are used in pulling up roofing materials. Hard to remove nails can be removed easily by using a crowbar. Repairing and replacing your roof should not be taken lightly. Your roof protects your home, and if the repair is not done well, it can add further damage. Having the right tools not only makes your job easier, it also helps ensure that you are doing things correctly. For assessment and help with major roof repairs, it is best to call a trusted roofing professional.